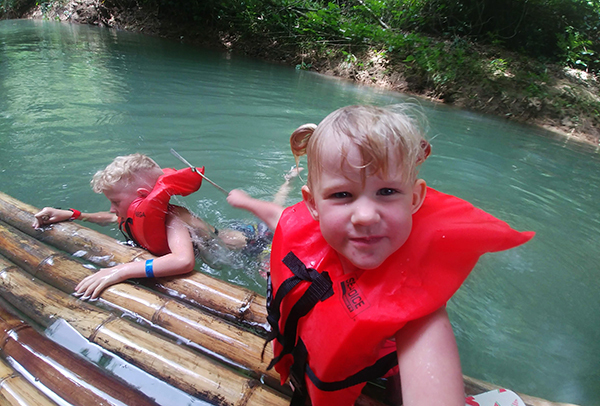 Bamboo River Rafting on the Martha Brae River was our favorite excursion when we stopped in Falmouth, Jamaica during our Disney Cruise on the Disney Fantasy. 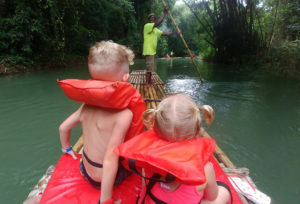 This is not to be confused with white water river rafting, which is typically what comes to mind when we talk about this excursion and everyone’s jaw drops to the floor when we tell them we took a three year old. Actually, this is better. 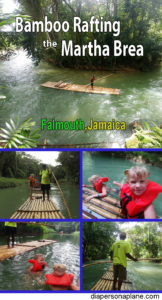 Leisurely island rafting on a 30 foot bamboo boat led by a personalized guide who teaches you one on one about the local foliage, wildlife, geology and history of Falmouth, Jamaica. 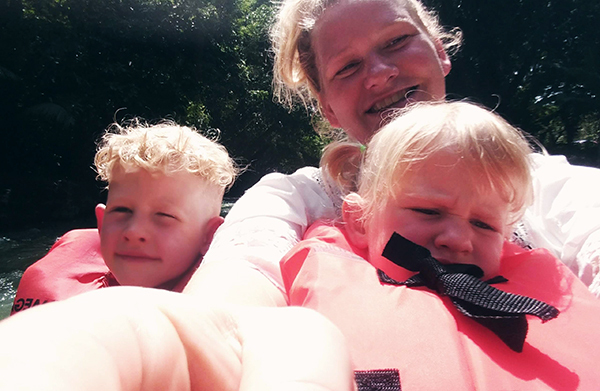 Swimming alongside the raft, laughing, playing, and soaking in the sun for two hours. 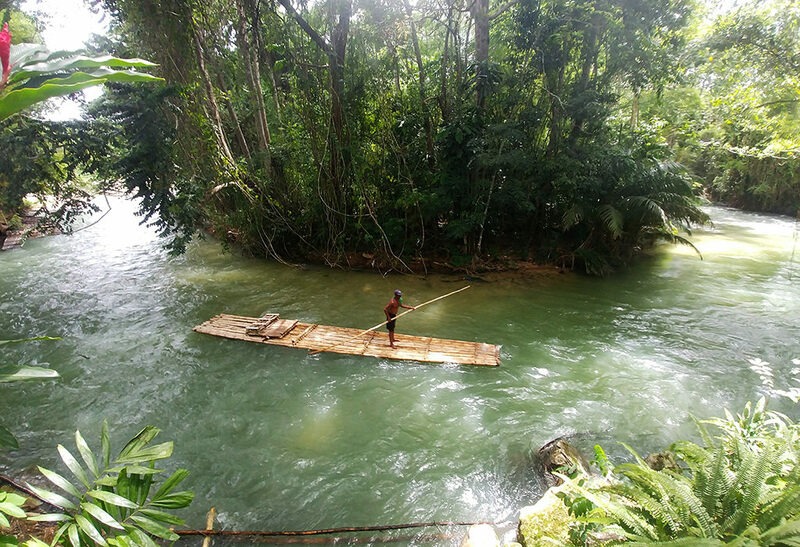 That is Rafting on the Martha Brae. 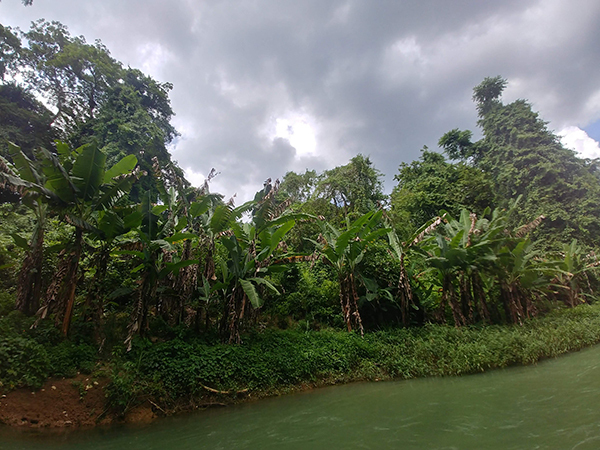 Covered with towering trees with branches that reach across the river to form a canopy of lush vegetation. It’s not having a care in the world. It’s island life. 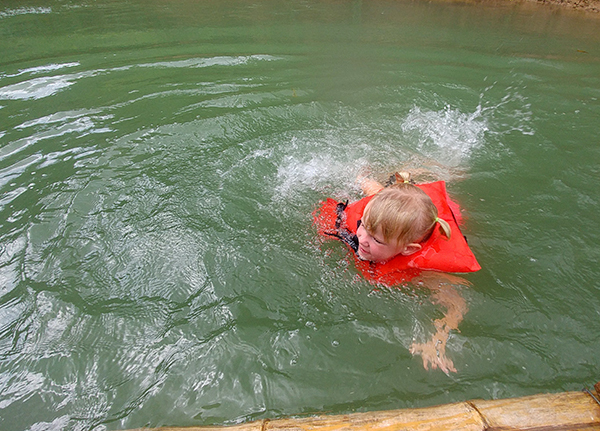 We booked directly through Martha Brae Rafting Village which saved us approximately $32 over booking through Disney. People will tell you when you book outside the cruise line you aren’t protected in case your itinerary changes, or you don’t make it back to the boat in time. We have never had this problem. First off, we didn’t pay in advance. Secondly, we are ultimately responsible for what time we make it back and we watch the clock. 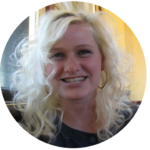 Just a little bit of personal accountability is all it takes to save a bundle and enjoy a wider range of excursion options. 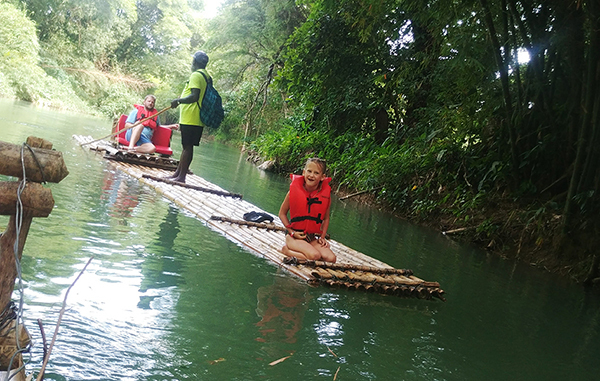 For this tour, we actually ended up with all the other Disney cruisers intent on Rafting on the Martha Brae. We just paid a lot less! 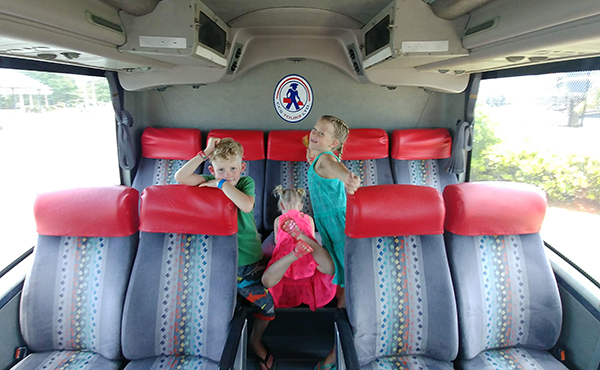 The tour was aware of our port and itinerary changes due to a Hurricane and emailed us the updated itinerary without any effort on our part. We got all the same perks for less money! 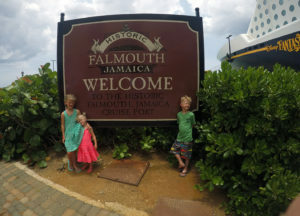 We were picked up from the cruise dock in Falmouth, Jamaica. This dock is a full outdoor shopping center full of stores, handmade wares, live music and restaurants. Including, perhaps, the last known Quizno’s in the modern world. We didn’t have much time to look around before our excursion, but because it was short we knew we’d have time on the tail end. We rode on an air conditioned bus to the loading pier. The drive itself was approximately 20 minutes. Along the way, our driver, Paul, and our guide, Taneisha, gave us historical, geographical and cultural information about the island and each area we passed through as we drove to the pier. We were able to view local homes and learn about the process of building homes in Jamaican culture. Jamaicans frown upon borrowing credit and having debt. Instead they start with a small concrete home, and build on it room by room as their family grows. In a few years, a once shanty concrete room is now a palace. We drove by the school where Usain Bolt attended and started his running career to become the Fastest Man in the World. 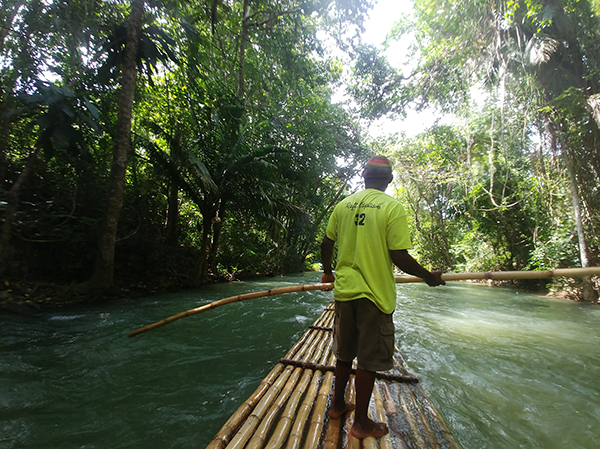 We even learned a few Jamaican words and phrases before heading down the Martha Brae. Once we arrived at the port, we were all issued life vests and separated into two and three person groups according to our families or parties. 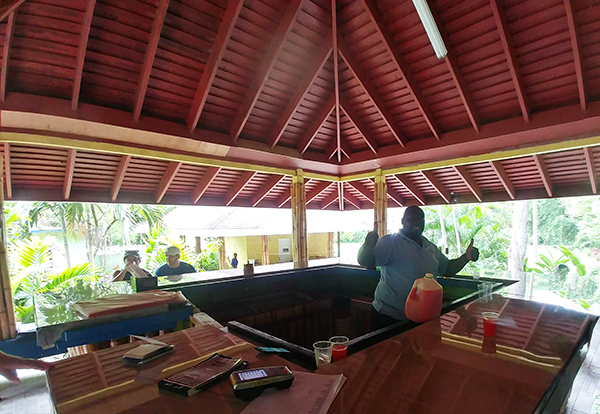 While waiting we enjoyed a non-alcoholic tropical fruit punch, and the beautiful scenery that was overflowing with dense vegetation spurred on by the heat and humidity of the Jamaican habitat, tropical sun, and abundant Martha Brae River. The Martha Brae River itself winded through the waiting area, and the tree branches formed halos of shade over the river. Docking was seamless with an operator at the helm quickly dictating the line up and loading each group onto the rafts. 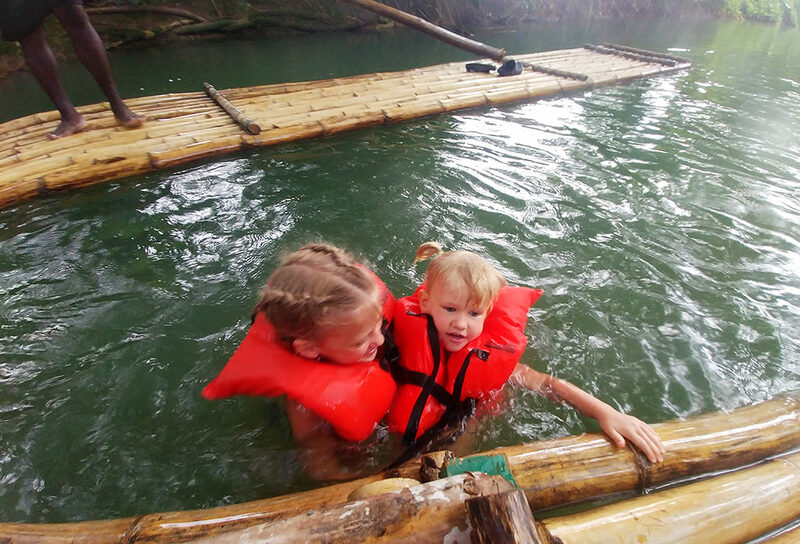 The rafts themselves are built by the guides from fresh bamboo that is cut, stripped, and fastened together. 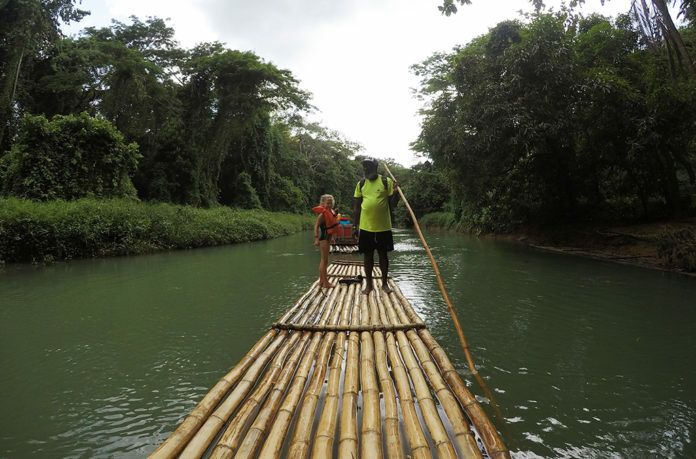 A singular 30 foot bamboo pole helps them steer and guide the raft down the river and around the turns and bends. Each raft carries two to three people. The guides each take one to three trips down the Martha Brae River a day, depending upon the season, and the rafts last 6-9 months before the guides have to build a new one. Gabriel took the trip with Pie and their guide Clay, and I loaded directly after him with Widmore and Eclair. Our raft was led by Anderson. The first part of the journey is a bit swifter and we were assisted by our guide in pointing out animals, wildlife, flowers and types of trees. We even got to see the types of the trees that the rafts are made from growing on the edge of the river. We learned about shy leaves, and were able to touch them and watch them close up with just the slightest touch! 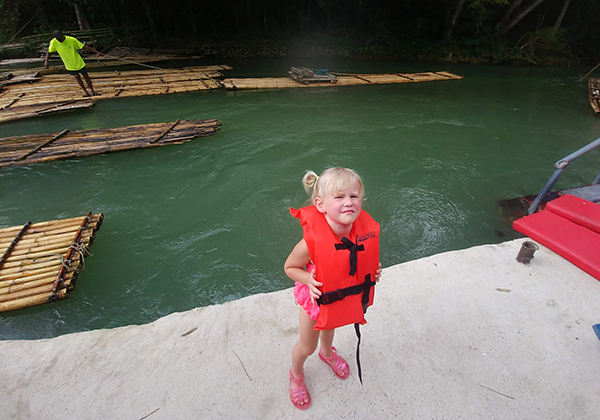 It wasn’t five minutes before Eclair was begging to get in the water, and so our guide quickly maneuvered to the calmer, deeper parts of the water so we could jump off the raft and squeal in delight. At this time, we caught up with Gabriel and for the rest of the journey Rafting on the Martha Brae, we were side by by side. Along the way, local entrepreneurs sold their wares and crafts. 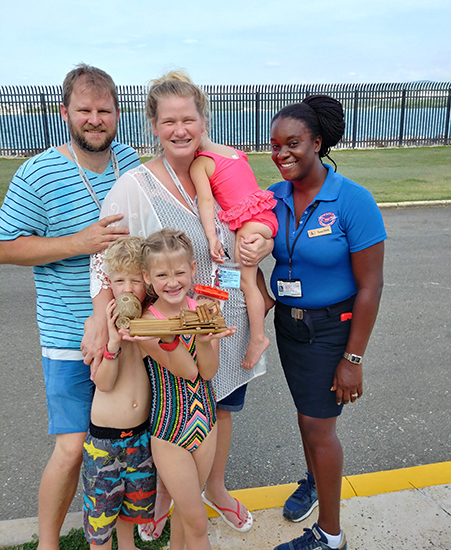 We brought home a miniature Martha Brae Bamboo Raft complete with seats that open and close. Eclair loved playing with it in the water, loading it with figs and pretending she was their guide. The guides also sold cups and maracas from gourds that grew alongside the river, and we purchased a hand carved mug as a souvenir. When Rafting on the Martha Brae ended we had the opportunity to purchase professional photos of our family on the raft with our guide. At just $10 a piece, we couldn’t pass up the cute memento. Our tour lasted over two hours as we leisurely made our way through the countryside and winding river. Others who docked after us, floated swiftly by us, and didn’t seem to enjoy their ride nearly as much. It was a little humorous and sad to see the looks on their faces as they went past. They definitely didn’t catch the island vibe and as much as we tried to cover up one of their screaming kids during the docking process in our YouTube video, the suffering was real. 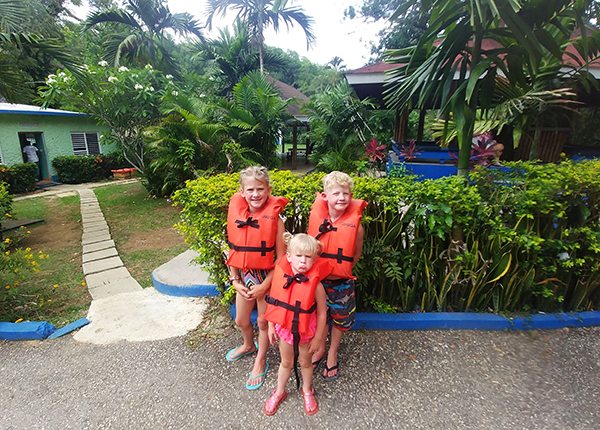 ► For Kids: This is one of the most relaxing ways Mom and Dad can spend the day in Jamaica while the kids are entertained in the water. 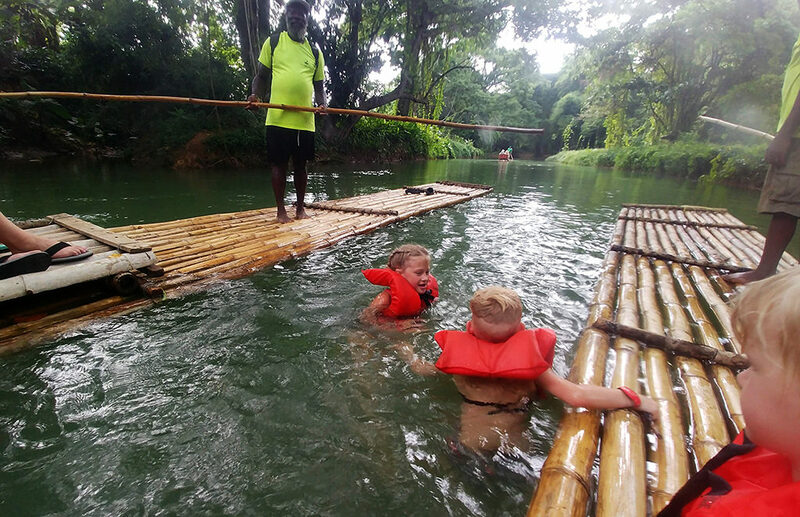 We all loved learning about the characteristics of the land, and the kids enjoyed the authenticity of swimming in the local rivers and seeing the friendly faces of merchants and passerbys. Bathrooms are found at both the beginning and end of the trip. Because this was a shorter excursion, we had plenty of time to look around the dock after our rafting trip. 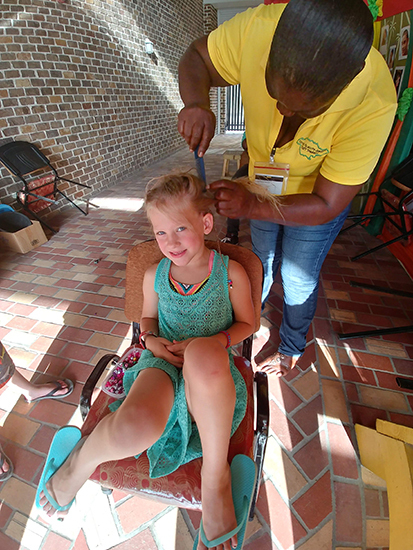 We purchased rum cakes, ate some jerk chicken at the Spice Kitchen and Bar, and had Pie’s hair braided! 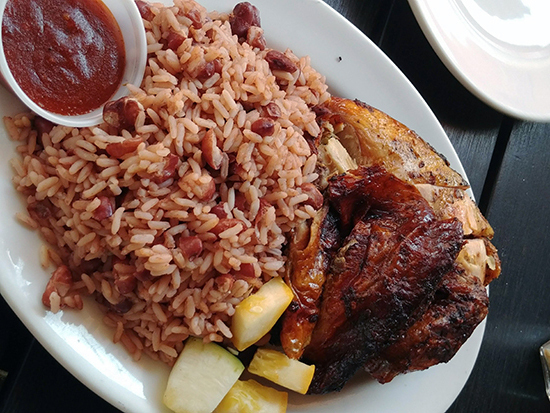 It was a perfect Caribbean day! When in Jamaica! Hair braiding time! She kept them in for over a month! ► Nap-Time Version: Our river rafting excursion in Jamaica during our Caribbean cruise on the Disney Fantasy Cruise Ship lazily floating down the Martha Brae River. Check out our other cruise adventures on the Fantasy including Castaway Cay, and snorkeling in Cozumel, Mexico!